Game Bar is a software program included with Windows 10 that lets you take screenshots and record and broadcast video games. It's also where you enable Game Mode, to quickly apply a group of settings specifically designed to make any gaming experience faster, smoother, and more reliable. There’s an Xbox link that opens the Xbox app when you click it too. Many users play games through this app, and thus, the Game Bar is sometimes referred to as an “Xbox game DVR”. Op​en any game from inside the Xbox app or from the list of apps available from the Start menu. 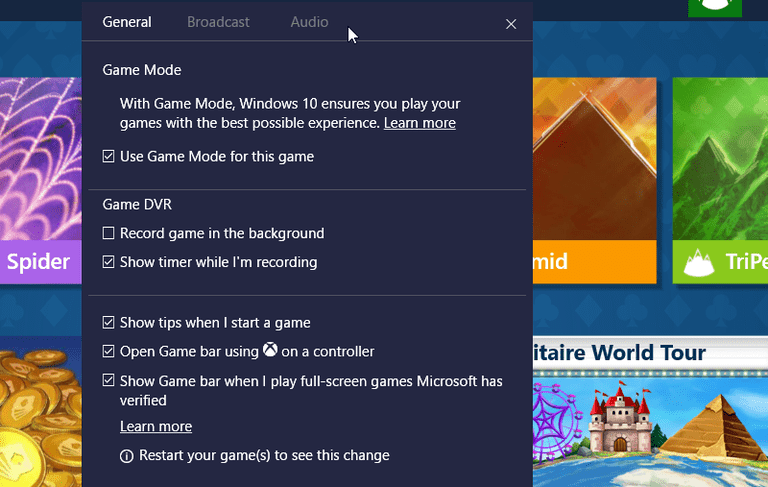 If you are prompted to enable the Game Bar, do so, otherwise, use the key combination Windows + G.
The Windows 10 Game Bar offers quite a few settings that allow you to personalize it to suit your needs, and they are separated into three tabs: General, Broadcast, and Audio. The General tab offers the most options, including one to enable Game Mode for the active game. With this option selected, the system will allocate extra resources to the game (such as memory and CPU power) for smoother gameplay. There's also an option to enable Background Recording. With this option enabled you can use the "Record That" feature on the Game Bar. This feature captures the last 30 seconds of play, which is a great solution for recording an unexpected and historic gaming moment. The Broadcasting tab lets you enable or disable your microphone or camera while broadcasting. The Audio tab lets you configure audio quality, opt to use the microphone (or not), and more. Hover the mouse cursor over each of the entries to see the name of the icons. Read each entry under the General tab. Enable or disable each feature as desired. Read each entry under the Broadcast tab. Enable or disable each feature as desired. Read each entry under the Audio tab. Enable or disable each feature as desired. Click outside the Game Bar to hide it. Likely the most popular option is the game DVR feature, which lets you record, or “DVR”, gameplay. This feature works in a similar manner as a traditional television DVR does, except this a live game DVR. You might also hear it referred to as an Xbox game DVR. Open a game and prepare to play (log in, deal cards, choose a player, etc.). Use the key combination Windows + G to open the Game Bar. Stop recording – A square icon. Click once to stop the recording. Enable/disable the microphone – A microphone icon. Click to enable and disable. Locate the recordings in the Xbox app or in the Videos > Captures folder. Just as there is an icon for recording the screen, there are icons for taking screenshots and broadcasting too. Screenshots you take are available from the Xbox app as well as the Videos > Captures folder. Broadcasting is a little more complex, but if you’d like to explore it click the Broadcast icon and follow the prompts to configure settings and start your live stream. There are various shortcuts you can use while playing a game to record clips and screenshots. You can add your own shortcuts. To do that, open the Xbox app and expand the menu > Game DVR > Keyboard shortcuts. Show someone a problem you are having with some particular software or a problem your computer is having.